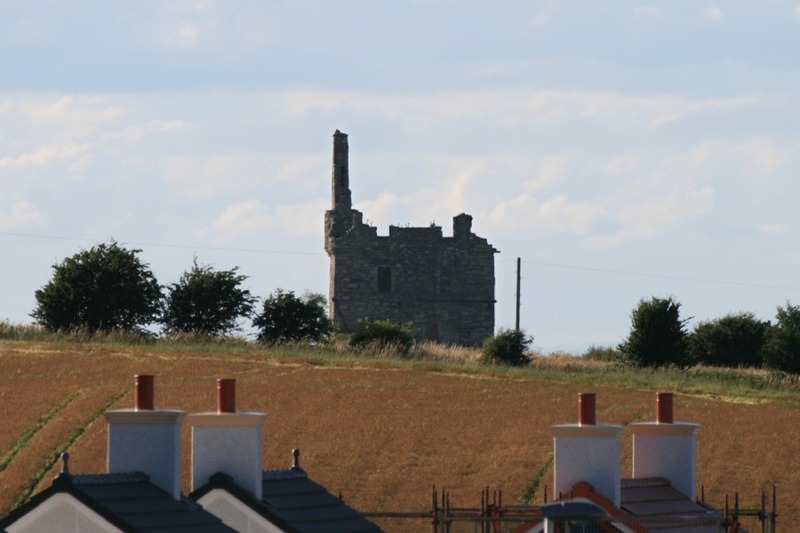 Greenan Castle is a ruined 17th century castle standing in a precarious position above a vertical sea cliff. 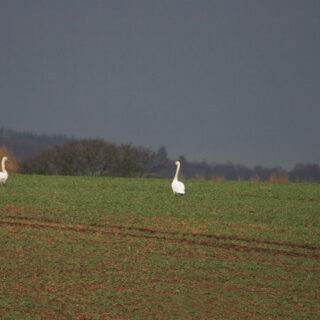 This site has been a defensive one for thousands of years, with a 0.4 hectare promontory fort pre-dating the castle. As early as the 12th century, and possibly earlier, a motte and bailey castle was built within the inner defences of the fort. The motte rises at the head of the promontory from within an area around 28m east to west by around 16m north to south, bounded to the south by a ditch measuring around 23m wide by around 2m deep. Beyond this ditch to the south was a bailey which would have been surrounded by a wooden palisade enclosing an area of around 70m by around 26m, protected to the south by an outer ditch measuring around 13.7m wide by around 3m deep. 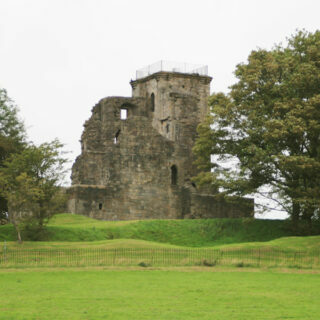 This early castle was held by Roger de Scalebroc (or Skelbrooke) in the 1190s, and may have been built by him following the suppression of a revolt in Galloway in 1186. Scalebroc was an Anglo-Norman knight who had travelled north to Scotland in the last quarter of the 12th century, and he was a vassal of Donnchadh, Earl of Carrick. 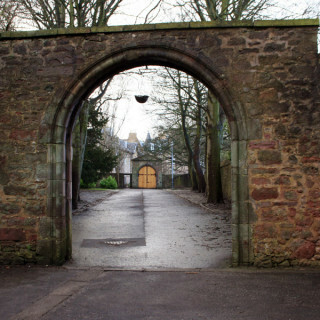 Scalebroc granted some of his land to the monks of Melrose Abbey, and later they also took possession of the castle. Later, during the 15th century, Greenan Castle passed from the Church to John of Islay, Earl of Ross and Lord of the Isles. In 1476 he made a charter of the lands of Grenane to John Davidsoun or Davidson, described as his “esquire and pupil”. 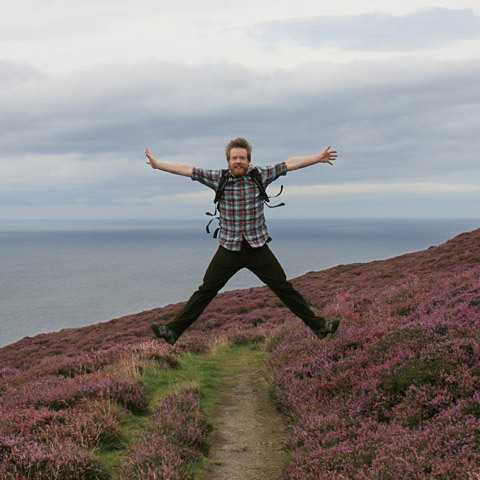 However some histories state that the lands of Greenan were forfeited by the Lord of the Isles in the same year for treason against James III. 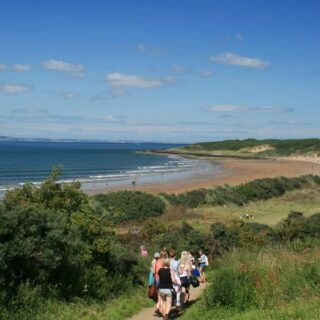 One source suggests that James IV granted the lands of Greenan to William Douglas of Glenbervie, the second son of Archibald, the 5th Earl of Angus, in 1493. However in 1510 it was owned by a Thomas Davidson, so it seems entirely possible that the Davidsons retained the castle throughout the 15th century. It was probably in the 15th century that the castle in its current form was built, and therefore that it was built by the Davidsons. Consisting of a rectangular keep built on the motte of the old castle, it measures around 10.7m north-east to south-west by around 8.5m north-west to south-east. Rising to a height of three three storeys and a garret, the basement is vaulted and was accessed via a turnpike staircase within the thickness of the wall at the north corner which also continued up to the upper floors. The original entrance was on the first floor in the south-east wall, and would have been accessed by an external timber stair. To the right of the door is a carved niche that would have originally contained a heraldic panel. On the first floor was the Great Hall, measuring around 7.6m by 6.1m, with windows on all four walls and a large fireplace in the south-west wall. The second floor also consisted of one large room, while the third floor was partly contained within the roof space and was lit by dormer windows. The north-east section of the upper storeys is missing, but the south-west section still has the remains of round turrets at each corner. It has been suggested that there were originally only three corner turrets while the north corner had a caphouse over the stairs. 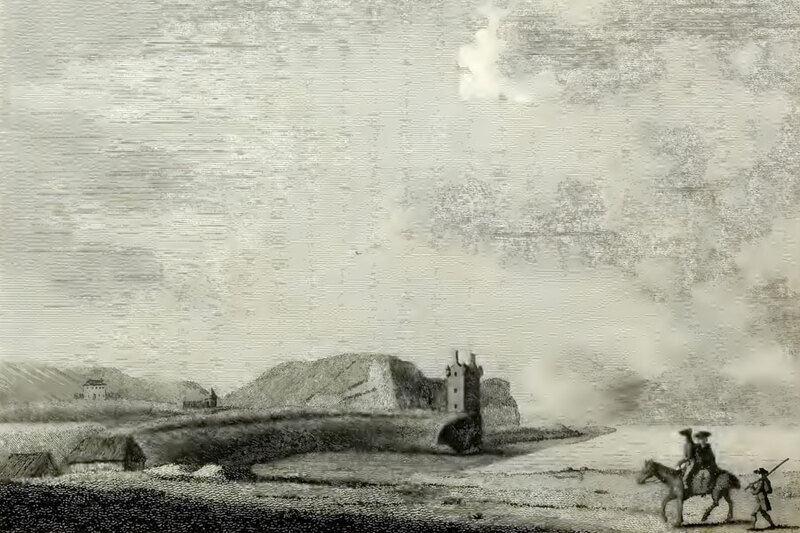 This may be speculation however, as a sketch by Francis Grose from 1789 shows the castle standing to its full height with both gable ends intact, but roofless, and seemingly a round turret at the north corner. In 1576 Thomas Davidson sold the barony of Greenan to Paul Reid, a burgess of Ayr, who in turn sold it to John Kennedy of Baltersan in 1588. Kennedy evidently set about remodelling and extending the castle in the late 16th century. A new second entrance was created at ground level on the north side of the tower, close to the edge of the cliff, leading directly into the basement. Above it a carved lintel was inserted, carrying the text “JK 1603 FMD” for John Kennedy and his third wife Florence MacDowell, with 1603 possibly being the date of completion. Kennedy added a three storey wing extending to the south-east of the keep. A barmkin wall extended from the south corner of the new wing before turning north-east and then north-west to join the keep. Within the courtyard would have been ancillary buildings such as stables and kitchens. In the middle of the south-west wall of the barmkin was a gatehouse, and immediately in front of that was a ditch crossed by a wooden bridge. 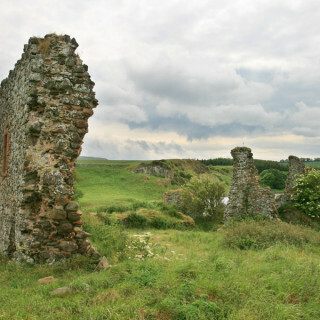 In 1602 Sir Thomas Kennedy of Culzean, younger son of Gilbert, the 3rd Earl of Cassillis, was murdered after leaving Greenan Castle on his way to Edinburgh. This was part of a long running feud between various factions of the Kennedy families, and was revenge for the death of Gilbert Kennedy of Bargany at the Battle of Brockloch in 1601. 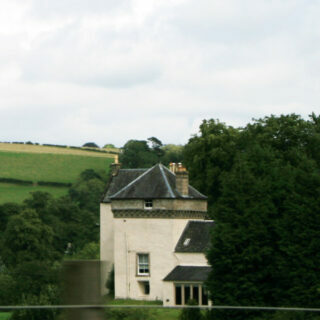 Sir Alexander Kennedy obtained the barony of Greenan, along with the estate of Culzean, from his brother James in 1622. The castle and barony was transferred between various members of the Kennedy family, including David Kennedy of Newark who in 1766 passed it on to his brother Thomas, Earl of Cassillis, in whose family it has since remained. 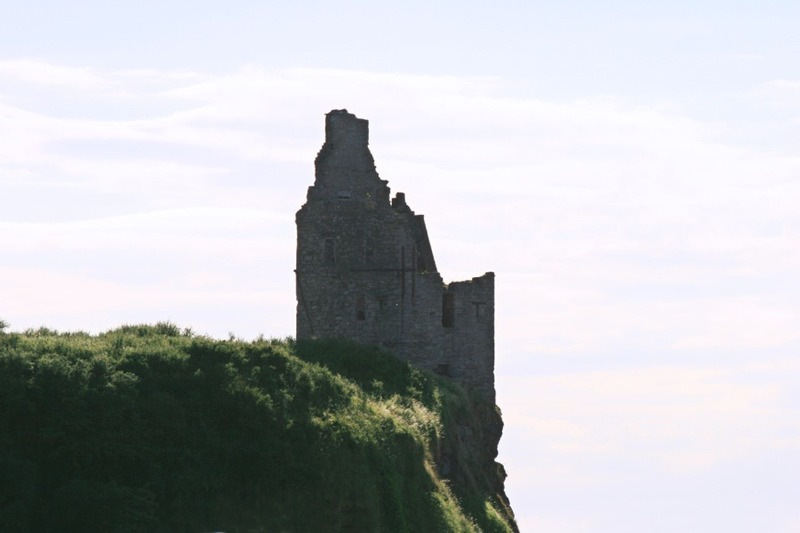 Today the castle stands as a substantial but precarious ruin, perched on the cliff top. The roof has long gone, and the upper two storeys of the north-east corner have fallen, with only the south-west gable end standing to its original height. Traces of the barmkin wall and ditch can still be seen on the landward side. Legend has it that a tunnel connected Greenan Castle to Dunure Castle, however since that is a distance of almost 7 kilometres this seems unlikely. Published on the 25th of July 2011 at 5:38 pm. Updated on the 25th of May 2014 at 4:23 pm.